You guys are all so photogenic. That is a great picture. Thanks for sharing. You are all so beautiful--inside and out!!! Love Ya. I can see why it is a favorite! You all are such neat people, we grateful for your friendship! Hey, I didn't know you had a family blog too. I'm adding you to my list so I can read up on what you guys are up to unless you don't want me to. Rick got home late last night he drives about 35 miles to and from work out by little Mt. On roads that rarely get plowed. He's gone off the road more than once. I worry all the time. I worry more about Challis going to school at Weber and driving by the mouth of the canyon in South Weber. Just you wait. I think I already told you how much I love this pic of your family. Your are all darling. Hey, one more thing. I just was looking at your blog and you have the beginner triathlete on as a blog you like. I'm totally going to check that out. One of my new years resolutions is to do a triathlon, so Anglia Porter helped me sign up for Woman of Steel yesterday....are you going to do it? Hi! I think if you click on my name you can get to my blog! If you could spend one hour with anyone. Take your pick. 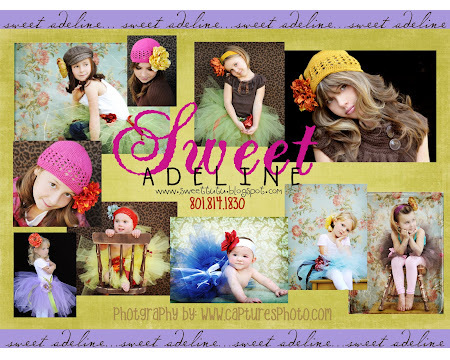 Sweet Adeline....Jen's new venture. Click the picture to be swept away to her new site.